I made this cake for my friends, cause 4 of them have birthdays in the same month. 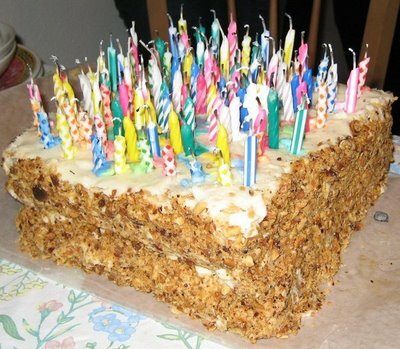 Thus the number of candles on this cake is equivilent to the total value of their ages all combined. The smoke detector did go off . . . .
How did i light this? I used fireplace matches. The are really long, so it's not like my hand is always in fire. The cake itself is a combination of a Russian Nepolean and French Nepolean cake. Meaning two different types of cake are layered together. And the inside filling cream and the outside frosting are also different. This was hella yummy.